Music is one among the performing arts that requires both creation and recreation that includes percussion instrument. Ghatam belongs to the group of percussion instrument. It produces rhythmic effects of sound depending on the force and clay composition that could influence the acoustic effect. • Madras Ghatam: Madras ghatam is light pot that can be played easily which requires less force to play. 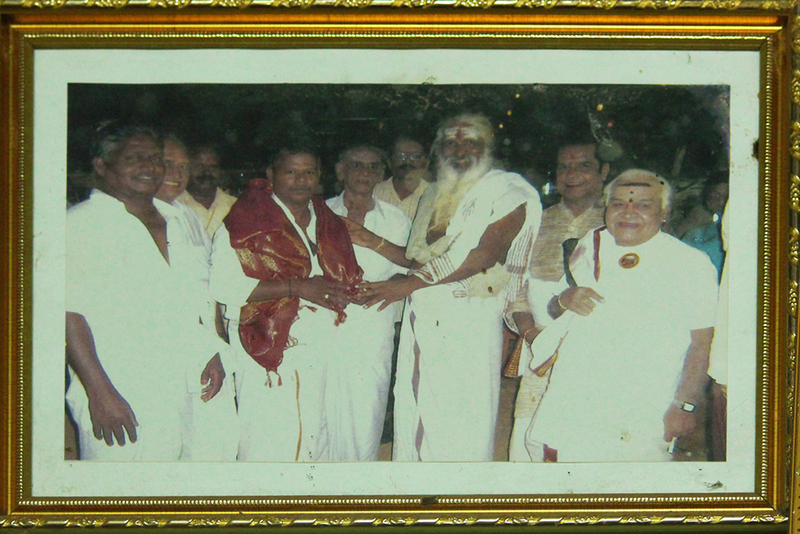 • Manamadurai Ghatam: Manamadurai ghatam is a heavy pot and is difficult to play. It has a very unique tonal quality that produces sharp metallic ringing sound. This type of ghatam is considered as the superior quality. 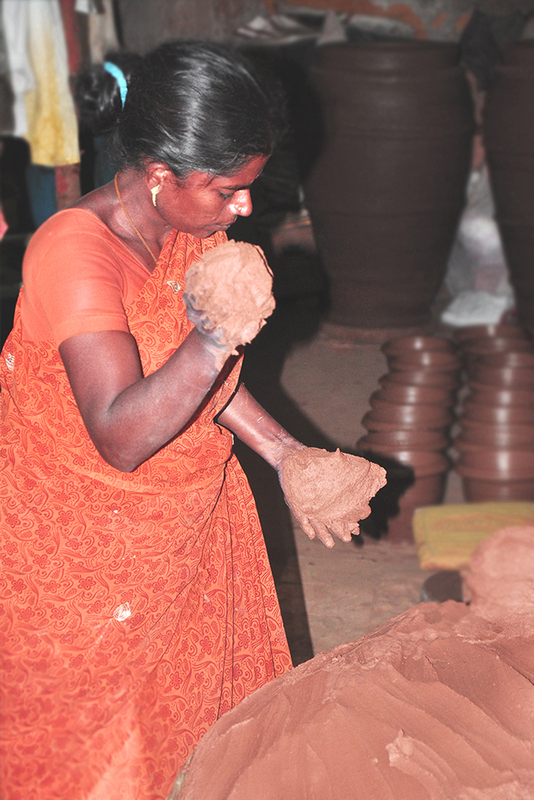 The making of the ghatams are dependent on the quality of clay that is used to prepare ghatams. Thus the study/knowledge of the soil is important. 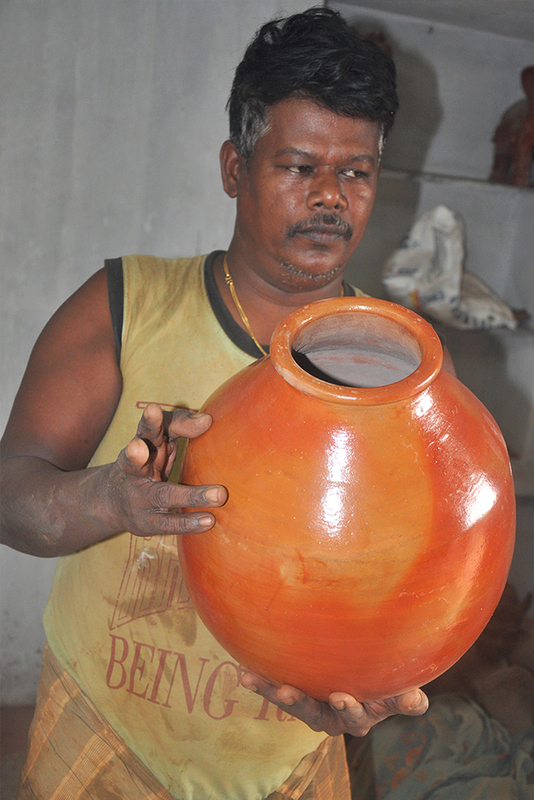 The composition of ghatams is mainly dependent on clay as it has a special quality. The appropriate amount of copper and iron filings mixed with clay plays a vital role while baking. To produce good tone of the pot, thickness of the pot walls is sustained even. The proportion of alloy and metals added during the making process of ghatam decides the pitch of the tone. T. H. Vinayakram known as Vikku Vinayakram is a Grammy Award-winning Indian percussionist. The credits of globally popularizing ghatam by bringing the revolutionary changes in doing fusion with western music with the earthen pot, using his enough experience of strategic and versatile handling of the instrument by Vikku Vinayakram is the most prestigious element for the country. Sukanya Ramgopal, a disciple of Vikku Vinayakram is also a female leading mistress of ghatam in India. Ghatam is played in two different ways. In North India the instrument is placed on small round block with its mouth facing upwards. They are played on the sides with right hand and on the mouth with left hand. Bangles and rings are also used to create sound. In South India, the instrument is positioned on the lap by its mouth facing the stomach. It is taped with fingers, wrists and nails on the surface of ghatam. It is the only instrument whose position is changed while playing. Sometimes to delight the audience, the instrument is thrown up and caught in the suitable rhythm during laya vinyasas. It is very challenging and significant in making amazing sound rhythms with resonance that gives various pitch on the application of different quantities of clay, plasticine and water on the inner surface of it. Thus the professional manufacturers are very cautious on the usage of soils, which is the major element for the instrument’s sustainability. It also ensures the safety and security to the instrument while playing ghatam with force. Soil is commonly meant as “dirt” or “earth”. In engineering terms soil is indicated as loose rock particles. Soil science includes edaphology and pedology. • Edaphology: It is the study of ecological study of soil that influences and interacts with the living beings, especially with plants. • Pedology: It focuses on the formation, description and morphology of soils. Soil texture is a qualitative classification tool that is used in both laboratory and in field to determine classes for soils based on their physical texture. Clayey soil is considered as the “skin of the earth”. It is distinguished by its color namely black, white, yellow and red that differs from all other soils, being tough, cold and wet. It consists of organic gases, liquids, mixture of minerals and interfaces with its lithosphere, hydrosphere, atmosphere and biosphere. Thus this particular type of soil is used for making the instrument ghatam. While making ghatam the five elements of nature like earth, water, fire, sun and air are invariably used. As earth is referred to soil and clay gets bounded by water easily. 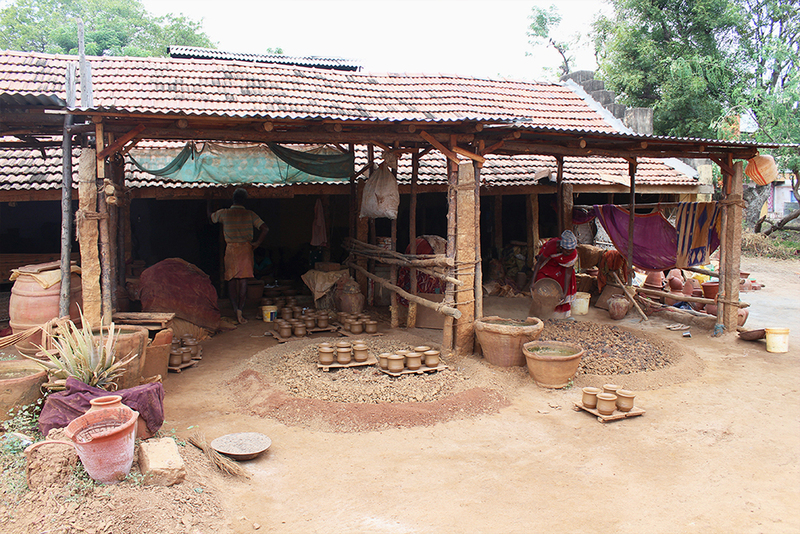 Sun helps in drying of the earthen pot. 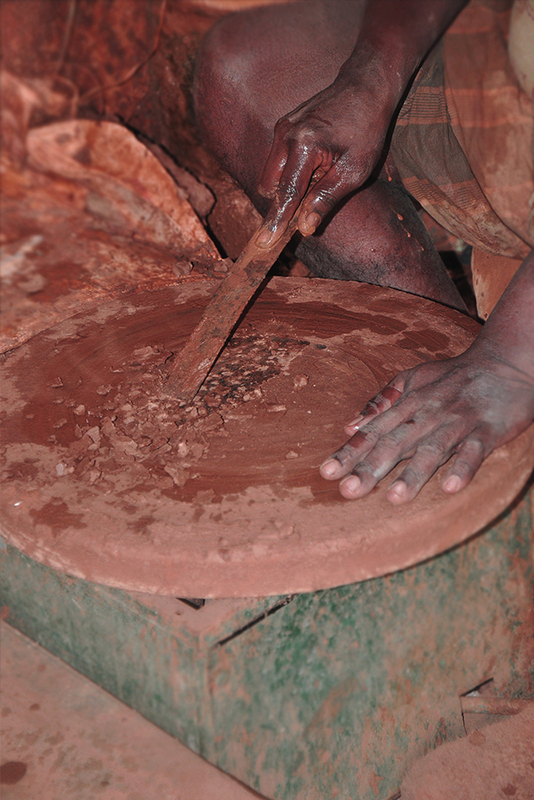 Later the clay is baked in fire and since the air is present inside the instrument, it initiates the sound creating its own unique timber. Some parts of the district from Kanyakumari to Cauvery basic including Vaigai River, Tirumanimuttar, Kottakaraiyar and Pambar sub basins are the best suited place to collect the clayey soil. Clay and alluvial soil comprising of sand is well developed along the Vaigai River courses. 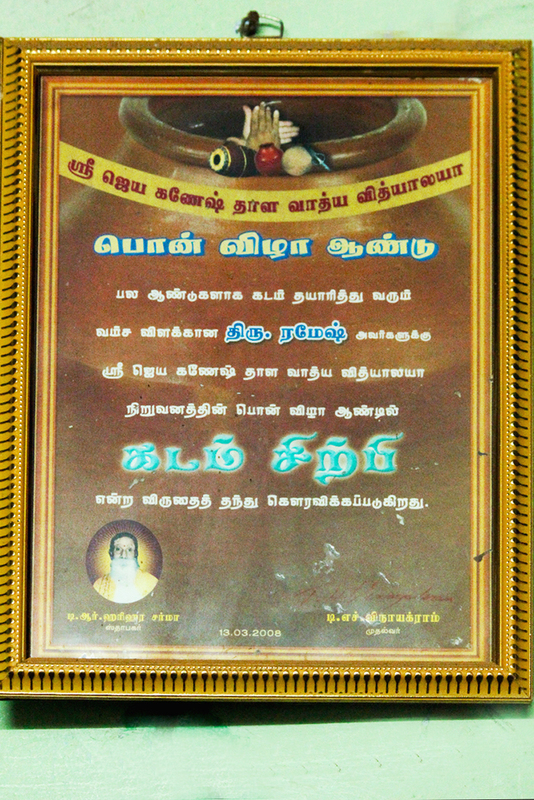 Places like Ilaiyangudi, Tiruppathur and Manamadurai Taluks are rich in black soil. Vaigai river and alluvial plain in Sivaganga, Devakottai and Manamadurai Taluks are rich in alluvium. Alluvium comprising of sand and clay is well developed in Vaigai riverbed. Usually alluvium thickness varies between 6 and 32mm. The thick and viscous alluvium containing red-lead and manganese found in this region are the prime factors for increasing the sturdiness of the ghatam. 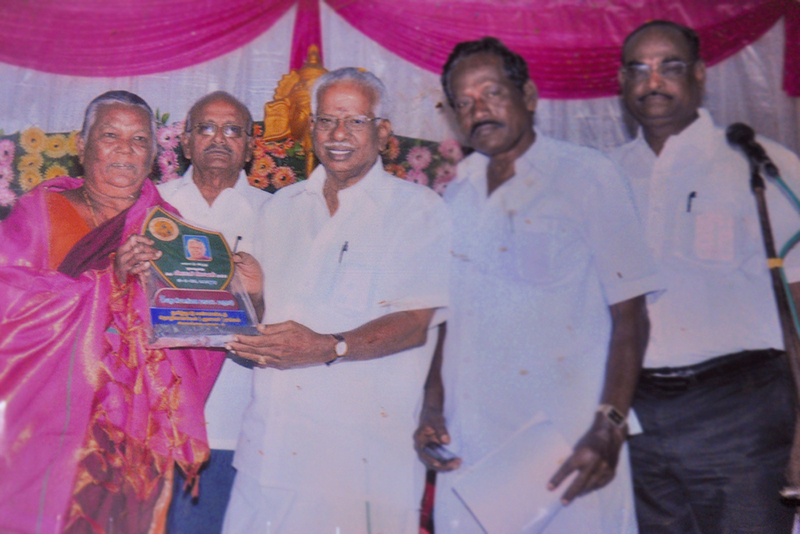 In Manamadurai utmost importance is given to soil governance that includes the study of chemical and physical properties, its water absorption, and its soil reactivity that is expressed in terms of PH. It is to measure the acidity or alkalinity of the soil. The experts also consider the rainfall on particular region that plays a vital role that adds in deciding the textural feel of the soil. Specific regions are monitored well with respect to time and space for the collection of correct soil sample. 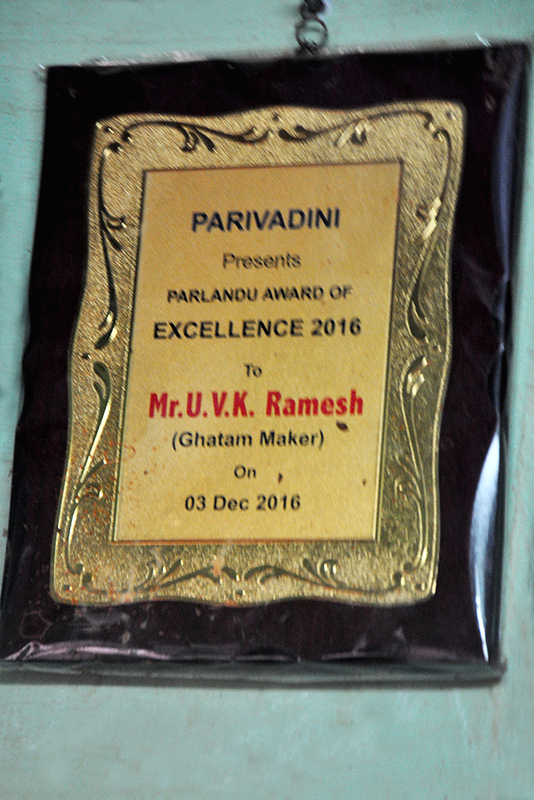 Ghatams are manufactured in Panruti, Chennai and Bengaluru. But the main place where the ghatams are manufactured is in Manamadurai of Tamil Nadu. 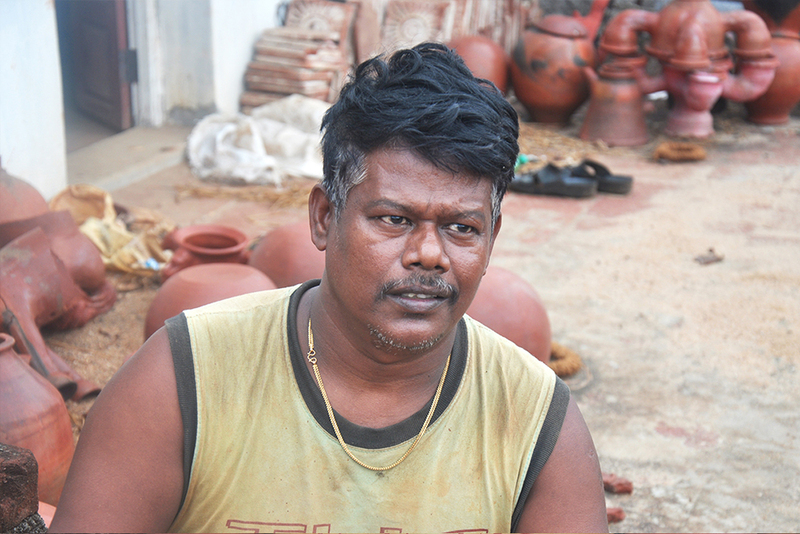 Meenakshi Kesavan (63 years old) is an expert ghatam maker residing in Manamadurai. 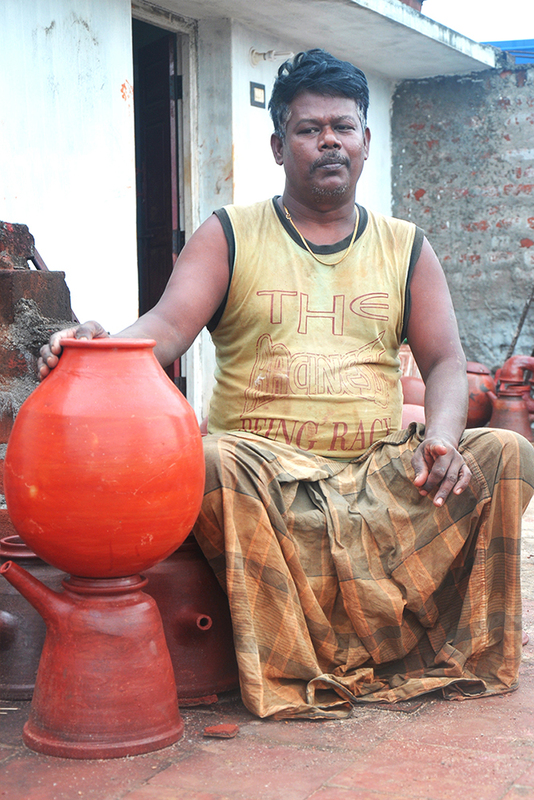 She and her family are the only ones producing the unique type of ghatam in the town for the past century. She has been involved in making ghatams since she was 15 years old. She got married into a family where at least four generations have made the instrument. Thus from then she is been tapping mud pots for more than four and half decades. 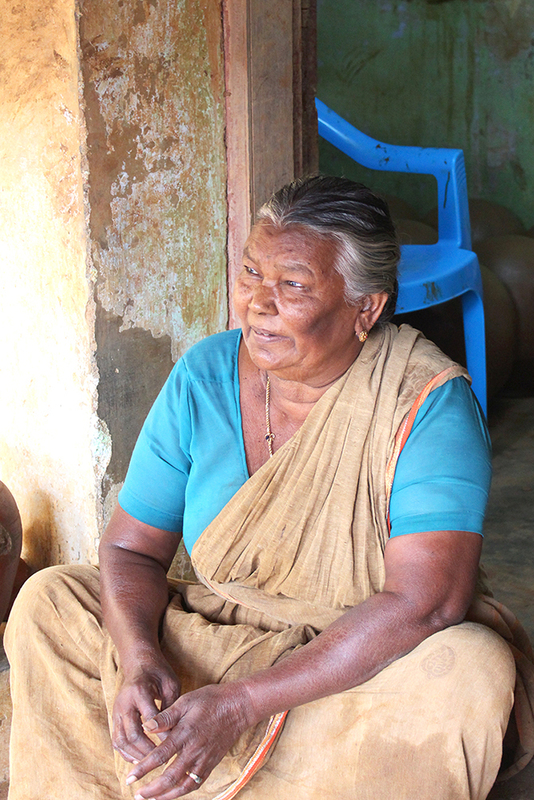 She learnt the art of making ghatam from her husband and father-in-law. 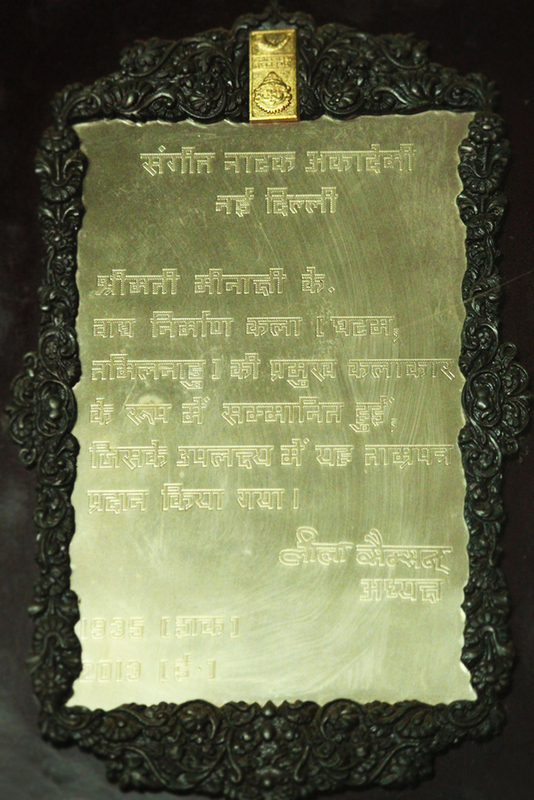 It is her family that is preserving their 160 years old legacy. 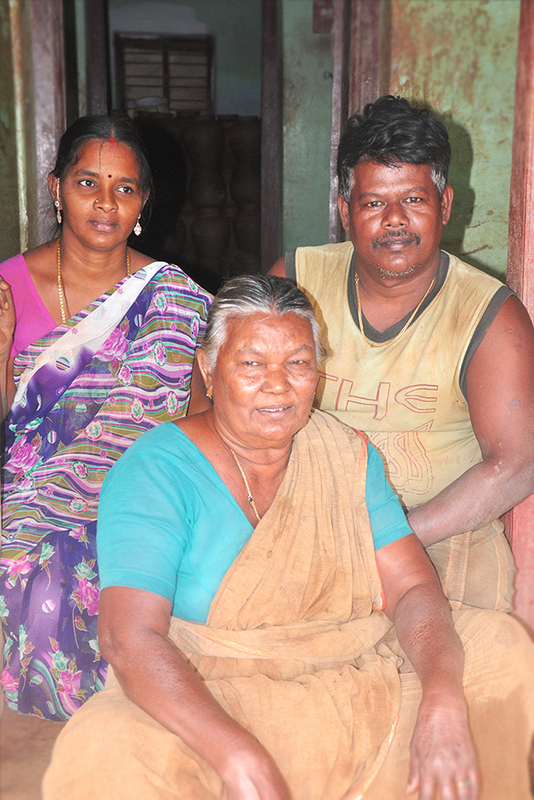 As per the information given by her son Ramesh, it takes nearly six years to master the art of making the instrument. But if the person being a non-traditional potter then it takes longer time to master the art. Ghatam maker Meenakshi Kesavan is fondly called as “the potter who got an award” in the region, as she is been awarded with the prestigious Sangeet Natak Akademi from the President of India on 11th April 2014. 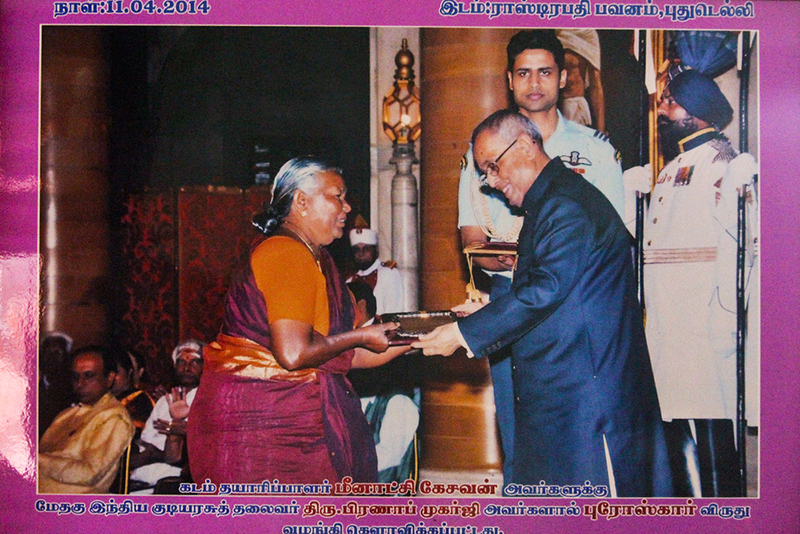 It is she - the very first instrument maker of the country to receive such prestigious award!